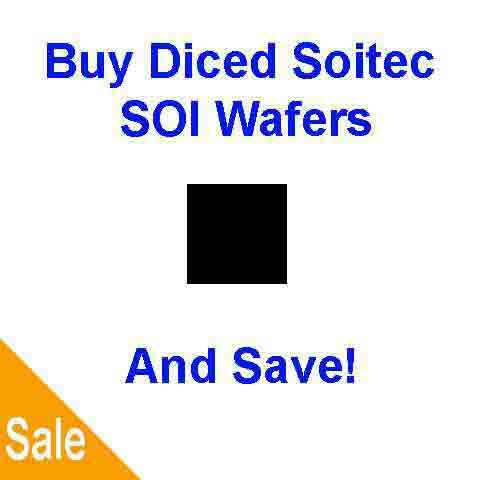 Get Your Diced Silicon Wafer Quote FAST! UniversityWafer, Inc's silicon wafer dicing service including cutting wafers with a wafer dicing saw and laser dicing silicon wafers. Our wafer dicing techniques do not damage the wafers and provide a smooth clean surface. Below is a 4 silicon wafer diced into smaller dimensions. Our wafer dicing process flow ends with the diced pieces secured on blue NITTO tape. Please send us your specs and quantity so we may quote you! We can dice any diameter wafer into the dimension you need. Wafer thickness is not a problem. UniversityWafer, Inc. and our partners provide researchers with creative silicon wafer and other substrate dicing solutions. Using precision diamond saws we can cut a variety of hard brittle materials. Small quantity wafer dicing at an affordable price. Larger volumes are available on request. Below are just a few dicing applications that clients have used us for. Micromachining of 75 micron thick Nitinol wire. The wire was cut into 1.8 mm lengths and 3 notches were cut into the sides of the piece. The notches were 38 microns deep and 175 microns wide with 2 notches placed on the opposite side from the third. Micromachining of various sizes of Nitinol springs and tubes. Cutting of 750 micron diameter glass and ceramic tubes. Cutting of custom sized microscope slides with delicate surface processing. Sawing of 1/4" thick quartz photomask. Sawing Silicon/Pyrex material with a special blade to provide an 8 degree sidewall. Providing "near Polished" cuts to eliminate a polishing step for the end customer. Delivering cut silicon pieces on non-tack tape to facilitate an automatic pick and place process. Dicing of wafers with very fragile bumps. Cutting and picking of die pieces from a 50 micron thick wafer. Placing high aspect ratio cuts in Ferrite toroids. (50 microns wide and 3.25 mm deep). Precision routing of very small printed circuit boards from panels.